Nvidia has launched a brand new heavyweight graphics card. The GeForce 9800GX2 is the fastest, most powerful graphics card ever built and Nvidia says it will revolutionise “your PC experience”. While it's nowhere near as big a step up as the 8800 was from the 7-series, the GeForce 9800GX2 is certainly an extremely meaty piece of hardware. It has two super-fast GPUs, each one with 128 dedicated processor cores and 512MB of GDDR3 memory. It all runs through PCI Express 2.0 too, the practical upshot of which is that the GeForce 9800GX2 is designed from the ground up for Gaming at Extreme HD resolutions. The Core clocks in at 600MHz, while the shader clock reaches 1500MHz and the 1GB memory boasts speeds of up to 1000MHz. That’s pretty quick, then. 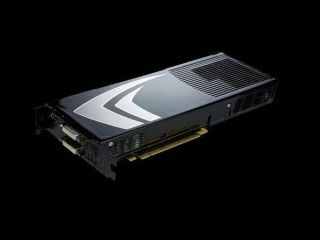 Gamers have been spoilt recently by super-fast, super-cheap 8800GT and GTS cards. But the 9800GX2 will not follow the same pricing structure. Cards have already been announced by the likes of PNY and Gainward, and prices are hovering around the £450 mark, so be prepared to pay for all that power.